Revisiting Ninja Theory's first PC game. You forget how many talented people worked on Enslaved. The story was written by screenwriter and novelist Alex Garland, who wrote the films 28 Days Later, The Beach and Ex Machina. It stars Andy ‘Gollum’ Serkis, who also helped develop the story and characters. And the game itself was designed by Ninja Theory, a studio with a knack for storytelling and action that would go on to boldly reboot the Devil May Cry series. When Enslaved was released for consoles in 2010 (the PC version wouldn’t arrive until 2013), Ninja Theory was a largely untested studio. Its previous game, a PlayStation 3 exclusive called Heavenly Sword, had generated a little buzz with its elegant, flowing animation and striking scarlet-haired hero Nariko. But Enslaved was its first big multiplatform game, and an opportunity for the studio to show the world what it was capable of. The game is a reimagining of Journey to the West, a 16th century Chinese novel attributed to Wu Cheng’en and popularised in English-speaking countries by Arthur Waley’s 1942 translation, Monkey. The story had been adapted many times before but Ninja Theory gave it a unique twist. Enslaved loosely follows the original story, but is set 150 years ahead of our present day in a vivid, colourful post-apocalypse. The reveal of this setting is brilliantly clever. The first level takes place aboard a slave ship flying across a vast ocean, from which protagonist Monkey (Andy Serkis) is trying to escape. As he hops across the vessel’s wings, he watches in horror as one of them is torn off by a large object we recognise as the Statue of Liberty. Then we see the sprawl of New York City come into view below, overgrown and crumbling. Ninja Theory has always been a visually imaginative studio, and this is an early example of that. It’s a wonderful introduction to the game’s setting, although the climbing is a little twitchy and weightless by modern standards. The slave ship section isn’t that much fun to play, but as a piece of scene-setting it’s magnificent. It’s when the flaming, battered ship crashes into the city that Enslaved begins in earnest. Knocked unconscious by the crash, Monkey wakes up to find a woman called Trip has fitted him with a slave headband. She needs his help to get back to her village and if she doesn’t survive the 300 mile journey, a dead man’s switch will be triggered and Monkey will die too. It’s an uneasy relationship to say the least, but he has no choice. And so the unlikely pair set off on their reluctant odyssey across the ruins of the old world. Antionades cites haunting PlayStation game Ico as the inspiration for their partnership. Monkey has to protect Trip but, crucially, she isn’t a dead weight. He handles combat and navigation while she hacks into computers and uses an EMP blast to disable any mechs. Trip’s the brains and Monkey’s the brawn, and the pair have to work closely together to get through the various challenges and puzzles thrown at them. The game’s design is fairly evenly split between combat and exploration, and the world is a delight to explore—especially the ruins of New York. 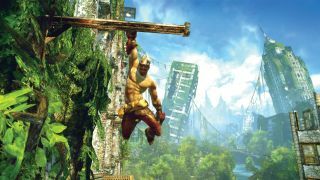 The piercing blue skies and leaning skyscrapers wrapped in green vines make for an intoxicating backdrop to the action, and the game sizzles with colour and energy throughout. It’s a remarkable feat of worldbuilding, and the landscape changes dramatically as you leave the city behind and make your way west into the wilderness towards Trip’s village. The combat is the weak link. Ninja Theory was clearly still finding its feet, and Enslaved’s battles feel shallow and toothless compared to the likes of DmC. It has a lot of flair—I love pulling the weapon off a mech and turning it against it—but combat is lightweight and repetitive. As such, the variety of locations and frequent puzzle breaks are a welcome relief. One involving a giant windmill (another Ico reference) is particularly well designed. When I first played Enslaved in 2010 I remember being amazed by how nuanced the motion-captured animation was. Today, while primitive compared to modern games, it’s still impressive. The story is well told, well acted, and has a few memorable twists and turns. Serkis is fantastic as Monkey, clearly giving the performance his all, and there’s a natural quality to the cutscenes that makes them compelling to watch. Enslaved was well received by critics, but the sales were below Bandai Namco’s expectations. The publisher hoped the game would sell a million copies by November 2010, but it ‘only’ sold 460,000, leading to a planned sequel being unceremoniously cancelled. This stopped the studio from expanding into two teams according to an Edge interview in 2011, but it did lead to a deal with Capcom to make DmC—arguably Ninja Theory's best game to date. But regardless of sales projections, copies sold, and all that fleeting nonsense, Enslaved is a game the studio can be proud of. It’s clear it made it because it wanted to tell this story in this particular way, and in a business so fond of safe, designed-by-committee blockbusters, that’s to be admired. A big publisher probably wouldn’t touch it today. I’m glad Ninja Theory still exists and is continuing to make challenging, imaginative games like Hellblade—perhaps this middle ground between indie and triple-A is the perfect place for the developer.